This week Microsoft are releasing a new update to the Windows Genuine Advantage (WGA) component of their Windows XP operating system. If your Windows license key is copied or stolen or you have made an attempt to bypass the Windows online activation process then now you’re going to get nagged. If your copy of Windows is not genuine (or your key has been stolen and published on the Internet), the new WGA component will start to nag you. Your desktop background will be changed to a plain black background. You can change it back manually, but every 60 minutes the background will default itself to being plain black. You’ll get pop-up notifications telling you that, “You may be a victim of software counterfeiting”. The same notification will be permanently displayed on your desktop background, just above the system tray. It’s true that ultimately someone with the right skills, time and determination will break the current WGA protection for Windows XP. Microsoft have identified Windows XP Professional is product most likely to be pirated. Software protection and cracking is an arms race where one side makes improvements to the product’s defences and the other seeks to exploit undetected holes or to crack (replace files) the product’s protection in order to bypass the defences. Each “side” has it’s turn at either attacking or repairing the defences of a software product. In order to reduce software piracy, Microsoft are adopting a common Micro-ISV strategy in coping with this software protection arms race; to reduce the turnaround time in changing the defences. As soon as a new crack is detected or a new product key is leaked, Microsoft will release a new update to their WGA protection in order to stay “one step ahead”. The pirates work will be wasted and they’ll have to start cracking the updated product all over again. “So what? I’m a pirate and I can live with that”. It’s clear that this new WGA update won’t put off those who either cannot or will not afford to pay for a genuine Windows XP license. However it will serve to embarrass and inconvenience businesses who have not paid for their copy of Windows XP. This goes for a lot of the “second hand” market too; where pirated Windows licenses abound. I’m sure the hacking community will break through the protection offered by WGA but it will be a smaller subset of the community that will keep up to date with pirated updates than before. We also don’t know Microsoft’s plans for the future. Sure at the moment they are just nagging, but it is very possible that they will disable some or all of the operating system for those who get caught. This happens a lot. When you purchase your computer from an OEM (e.g. Dell, Lenovo, Toshiba) they often use one license key for all of their installations. It’s easier for them that way since they have thousands of machines to get ready for customers. The key is pre-activated and is different to the unique key that they give to you. That key on your sticker is more often than not invalid for the purposes of activating a new Windows installation. The sticker is provided for legal reasons only. If you’re unable to activate using the key provided by your OEM, you need to use the recovery media (usually a recovery DVD) in order to rebuild your machine and ignore the misleading sticker! This happens a lot. A small business might accidentally have built you a machine using an image (a copy) of another machine’s operating system, including copying the key. 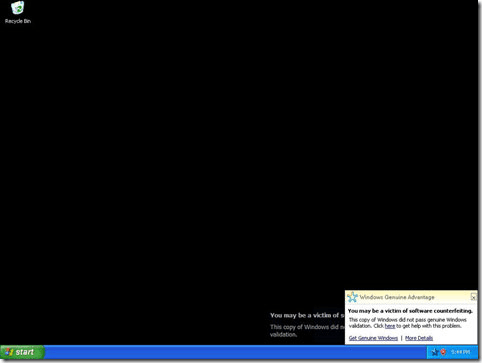 Windows detects that the machine is different and activates the WGA nagging. Unfortunately you need to prove to Microsoft that your license is genuine or go back to the shop and for a refund. Windows Vista already has the WGA technology built-in. This update is merely a retro-fit to Windows XP Pro, the most copied operating system in history. Does this new WGA update affect you? Has this article helped you? It took about 30 minutes to research and 30 minutes to type, so please leave a comment and let me know if it’s been useful to someone! By law you must maintain copies of all your software licenses. Software is intellectual property and is very rarely owned by the end user. Instead software is licensed from the vendor to the end user. You don’t purchase software to unlock it, instead you purchase a software license to give you the legal right to use the software within the terms of the license. In practice almost all software vendors implement a form of software/anti-piracy protection to keep the shop safe! If you haven’t got a copy of the software license for each piece of software you use, contact the original vendors. Even software developers have to eat and pay our bills! Next Post Web browser wars: Room for one more? Google launch "Google Chrome"
Timely article, Mike. I read about this coming up a few weeks ago in a tech alert. Having been bitten once by OEM I now refuse to use OEM software and purchase full retail licenses (It was convenient at the time to use the license, however the OEM in question had a staff member who went whoopeee! with the license codes and handed a few thousand of them out to all his buddies – XP and Office). I’m working on an article related to Windows piracy that I’ll publish sometime this week. Indirectly it’s related to Genuine Advantage validation and why I think we’re still being plagued by having to support “old” technology when in a sense in doing so we’re supporting Jolly Rogers. You have a legal copy of winxp pro that you bought for 200$ + tx. When I needed to replace my failed HDD the shop I bought the HDD from offered to reinstall XP for £30, I had my original XP Home OEM CD and key, so I asked them to use that. For some reason they decided to install a pirated copy of XP Professional instead, which incidentally passed all WGA tests including this latest WGA tool, and so it wasn’t long before I was having problems installing drivers, BSODs, slow browsing speeds and so on. I soon tired of all this and formatted my main HDD and reinstalled XP Home from my original backup CD and product key, and luckily I was able to reactivate my genuine OS again, despite changing my videocard and installing a Gigabit LAN card before reactivation. Needless to say my PC is running better than ever now, and after all this there’s no way I’d use a pirated OS. That said I can understand the motivation for doing so and agree that Microsoft should stop being so greedy. if this does happen do you get caught and fined?? I haven’t heard of any caught individuals being fined, no. Businesses, yes. However why would you want to use a pirated Windows license? You’ll not be eligible for updates (and Windows is an oft-targeted platform for malware) or fixes and you might be using one of the “cooked” versions of Windows that come with trojans and viruses pre-installed. If you’re struggling for cash, I suggest as Dexter helpfully points out – use LINUX. It’s free and you’ll probably pick up some good technical skills along the way, learning how to use it. Alternatively, if you’ve got the money, why not try OSX? So: other than being illegal, you have to trust the pirates and you won’t have any windows or office product updates, security patches (of which these are one or more a week!) or fixes. You won’t have service packs. I’ll put it to you this way, is a pirated windows licence worth the money? Can’t agree with dexter. It’s not Microsoft’s fault as such – the operating system is the most used in the world. It attracts the most number of malware writers because of that. The Mac is starting to see more since it gained a little market share. Linux is certainly in many ways more secure, but the reasons aren’t as simply as “more money being spent by Microsoft”. When you’re the biggest, and they are, you have baggage to carry. You have to support older code from older OS’ written by programmers, particular in large coporate IT depts, who should know better. Given these same companies by most of the licenses for Windows it’s understandable Microsoft has to be backwards compatible. I’ve been running Vista since last March. It’s a beautiful OS, works like a charm and a huge improvement on XP. Where Vista tends to have issues with consumers and companies is where it does indeed break backwards compatibility. Microsoft is attacked for not being secure and attacked for tightening security (which is where most of the Vista problems come in). You can’t have it both ways, and I’m not talking about UAC here, but the very core of Windows itself. I always thought that Microsoft is a little too strict with its activation policy, especially their “one time install” deal. It gets to be such a hassle if you have to reinstall.